Woe Tantalum was once the location of a highly successful human colony, which prospered despite a lack of sanction or support from the Imperial Combine. The pioneers who first began to develop the planet called it Parable Light. The original colonists sought to escape what they saw as a stifling, authoritarian society, and did everything they could to cut ties with the Imperial Combine. True to form, Earth did its bureaucratic best to hinder Parable Light's development and eventual success. Despite that opposition the colonists built what Silane Creid described as "a beautiful, clean, productive colony, with a capital modelled on the Imperial ideal and several thriving townships ... a shining example of the entire ethos of the colonial frontier" (→TRD). Woe Tantalum is a terrestrial or "rocky" planet, with a strong magnetic field and liquid water — all features which contributed greatly to the development of abundant native life. At one time the planet was very similar to Earth, and was catalogued as a class one planet when humans first arrived. In 3716 ELC, however, a mysterious disaster scoured all life from the planet's surface. The colony was said by all credible sources to have destroyed itself. The atmosphere of Woe Tantalum is now very thick and highly energetic. Layers of violent, billowing storm clouds wreath almost the entire planet in a shroud of purples, browns, and dark greys. From orbit there are only fleeting signs of the surface. Transit through the atmosphere is made dangerous not only by the high winds, but by powerful electrical discharges. The actual surface of the planet is a barren wasteland of scorched and twisted ruins. It was reported throughout the Empire that the terraforming technology used on the planet caused a highly energetic chain reaction in the atmosphere, which seared the surface and killed all living things. Critics have questioned precisely what this technology was — and why it was used on a habitable planet — to no avail. Woe Tantalum once had a thriving biosphere which was almost as rich and diverse as that of Earth itself. The planet was awash with life, and the human colony established there was completely self-sufficient with regards to food and natural resources. Now the surface is a sterile wasteland. It is possible that microbes such as autotrophs and chemotrophs still survive deep in the planet's crust. ​During its heyday, the dominant sentient species of Woe Tantalum was humanity. There is no longer any permanent population. In March 3745 ELC, Elm Caden and his companions discovered a number of Rasas hiding out in a ruined city on the surface of Woe Tantalum. They had bypassed the quarantine network, using codes supplied by Joarn Kages, and appeared to be using the planet as a staging area of some kind. They are no longer present on the planet (→SFTD, LOTD). ​A planetary quarantine network prevents ships from approaching high orbit, and indeed also stops anything from leaving the surface. This network was installed by the Imperial Navy as a means of keeping people away from (a) the possibility of residual infection and (b) the possibility of learning the true fate of the colony. There is no gate in the system, and therefore no nexus.​ This makes it very difficult — almost impossible in fact — to spy on activities around or on the planet without getting in close. Elm Caden and his companions tracked Medran Morlum to Woe Tantalum in March 3745 ELC, and found him hiding amongst the ruins of the largest city. It was during this encounter that Caden realised much larger events were in motion than he already suspected (→SFTD). A Life and Rescue operation took place on Woe Tantalum following the conclusion of Caden's mission. The operation was directed from the ICS Disputer and involved the establishing of a field hospital on the planet's surface. Injured MAGA personnel and crew from the Hammer were treated here in the first instance, before being lifted off-planet (→LOTD). When Elm Caden later pooled his findings with Eyes and Ears, he discovered that Imperial scientists had found biological anomalies in all the enemy personnel captured on Woe Tantalum. The planet had apparently been a base of operations for people — humans and Viskr alike — who were in medical states similar to that of Amarist Naeb (→TRD). Aker Santani's questionable tactical decisions in the Battle of Woe Tantalum were considered in a much more favourable light following the events which unfolded shortly afterwards at Meccrace Prime (→TRD). After returning to the ICS Night's Shadow from the mission at Forge Ruinous, Caden forced a confrontation with the Emptiness. During their conversation, the Emptiness claimed that Caden had made an agreement with it while he was on Woe Tantalum (→FSS). Caden and Admiral Betombe briefly discussed the possibility that a dreadship might have crashed on the surface of Woe Tantalum, and that a mission to find and study it was a real possibility (→FSS). Caden's mission to Woe Tantalum was supported by the MAGA unit Bullseye Company. The company lost their captain — Udis Pinsetti — and their entire Third Platoon when a lander was shot down, as well as losing soldiers from the other platoons to skulkers and Rasa troops (→SFTD). 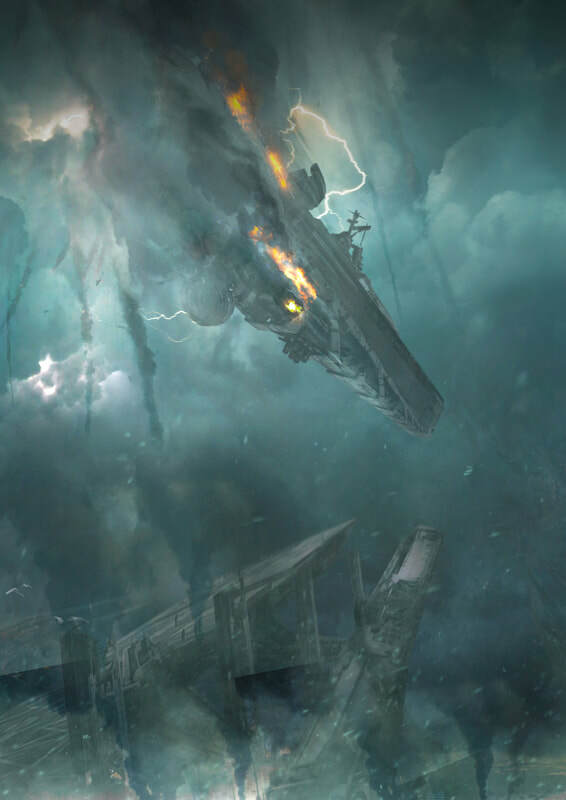 The ICS Hammer was destroyed when Aker Santani was forced to use the planet's quarantine network to fight off a pursuing Shaeld Hrathan dreadship. The network fired on Hammer as well as the dreadship, causing it to crash to the planet's surface (→SFTD). Caden's conversation with Medran Morlum contributed directly to the man's death. Prompted by the Emptiness, Caden bullied Morlum into telling him critical information about his masters. This caused the android Prem to kill Morlum, as a means of keeping those secrets safe (→SFTD). Information broker Joarn Kages identified the first signs of evidence regarding the true fate of Woe Tantalum. When he went snooping around the Imperial Combine's database to find the official, empire-wide List of the Dead, he discovered that some of the colonists were still moving freely around Imperial space, despite being declared killed in the unspecified disaster. He shared suspicions with Caden that there was no disaster, and that the Imperial Navy had in fact glassed the entire planet (→LOTD). In Caden's meeting with invigilators of Eyes and Ears, after they had debriefed him on his encounters with Voice and the Rasas, he revealed his knowledge of Woe Tantalum and accused them of having Fleet glass the planet. Surprisingly, March Bel-Askis admitted that Eyes and Ears had indeed allowed this horrific act to occur, as a last ditch attempt to stop a wild and unknown infection from spreading. It was then that Silane Creid revealed the partial history of Parable Light (→TRD). In the belly of Forge Ruinous, on Lopama, Herik Pammon was located and confronted by Elm Caden. As a first generation Rasa who had escaped the glassing of Parable Light, Pammon was able to explain how the entity known as Voice had spoken to the population of the planet through the Shaeld Hratha, sharing his 'gift' with them in order to do so. Caden rightly surmised that this 'gift' was in fact the virus which creates Rasas, or perhaps a prototype version of the virus currently in use. Pammon went on to explain that Voice had warned the colonists of a terrifying future, but also shown them that he had a way they might all escape it. From that point on, everything they did was in service to Voice's great crusade. It was not long before ships arrived to investigate why the colony's comms traffic was so erratic. Shortly after those ships had reported back the planet was quarantined, and eventually glassed (→FSS).